How do you like your gazpacho? Smooth or chunky? Spicy or sweet? I’m such a gazpacho lover that I like it any way, honestly, and mix it up every time that I make it, depending on my mood and what I have on hand. This version is a combination of elements from two friends’ recipes: Artist Maud Bryt, and co-Minnesota Food Blogger Laurie Jesch-Kulseth, who writes the lovely blog Relishing It. I love the tomato juice that Laurie uses, and so enjoy the hearty dash of paprika and fresh herbs that Maud calls for – together they make a particularly delicious gazpacho, as spicy or smooth as you want it to be, rich and tomato-y. If it’s a really hot day, Maud adds more cucumbers. Laurie makes her own garden-fresh tomato juice. It’s fun to experiment with adding watermelon, your favorite herbs, or hot chiles. The key to a really tasty gazpacho is to taste and adjust and make it your own. 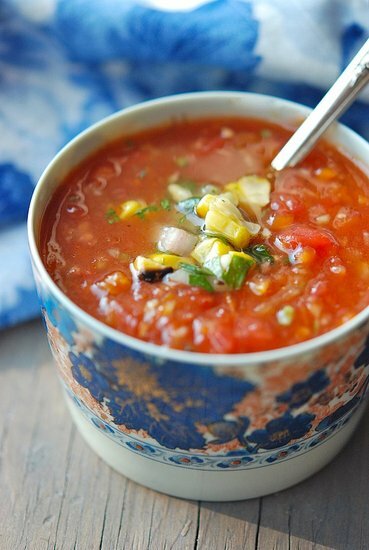 Gazpacho tastes best when made several hours or one day before serving. Note: I added the Grilled Corn Salsa I posted a couple of weeks ago as a garnish and it was a lovely addition. Other nice toppings include croutons toasted in olive oil, avocado slices, a spoonful of crab meat, or one of the best toppings I’ve ever had, crispy-fried rock shrimp. It was in a restaurant, but I’ve been meaning to recreate… Instead, I usually eat it straight out of the bowl. Add the cucumbers to the bowl of a food processor. Pulse until cucumber is chopped into small pieces but not pureed. Scrape cucumber into a large bowl. Process the red bell pepper in the same way and add to the cucumbers. Continue with the tomatoes. Process the red onion, garlic, and parsely together and add to the bowl. Stir in the tomato juice, red wine vinegar, olive oil, paprika, red pepper flakes, salt, and plenty of freshly ground black pepper. You can taste to correct seasoning at this point, but it’s best if you cover the gazpacho and chill for several hours or overnight and then start tasting and adjusting the herbs, vinegar, olive oil, paprika, red pepper flakes, salt, or pepper. That's exactly what I love about it too - I hope you enjoy the paprika! Gorgeous! I love gazpacho and how it always tastes a little different depending on who makes it. I like the idea of adding paprika - sounds like it would give it a lovely little kick. Zing and fresh lime! Perfect. I'm with you! I could eat gazpacho any time of year. I personally like it with a little zing and fresh lime.